Beautiful Hotel, great breakfast. The room is big and clean, really comfortable. The staff is absolutely wonderful, really kind and helpful. Our hosts were very helpful with some logistics issues we had. The transfer service to the new port was great. The breakfast was very good and healthy. The place had everything you need for a stay in Santorini. Unfortunately, Santorini was so great, and we were only there for such a short time, we didn't get to hang at the Village as much as we would've liked to. We were constantly on the go, but the little time we did get at the Village, we fully enjoyed. The rooms are excellent, the property is beautiful, and the staff is incredible. They cannot wait to help you or answer any questions you have. And don't miss the transfer from the airport or to the airport. Their van is incredible!! We really loved this place and we can't wait to stay here if we make it back to Santorini!! Great location near Megalochori, beautiful pool and property! The staff was exceedingly nice and helpful. The pool was nice to have even though we didn't go in it, but we sat by it one evening and that was very pleasant. You need a car if you stay here. Gianna, her husband and daughter own and operate this wonderful hotel. Check in was very nice. They expected us and greeted us by name. Discussed the hotel, made suggestions and showed us to our room. We arrived early enough to take advantage of the beautiful clean pool. Our room was "cozy" which is what we reserved. Breakfast was awesome. Homemade pies both sweet and savory and plenty to choose from! Coffee, juice, croissants and too many others to mention. One of the best breakfasts we've had by far! Everything was close by. Great location for visiting Akritiri and the beaches. Gianna gave my wife a necklace she had made of local volcanic rock. Such a nice gesture. A great souvenir! Gianna, her family and staff are wonderful. The resort is spotless, well-maintained, and a pleasure to stay in. The breakfasts were tasty and a nice way to start your day. They helped us obtain transportation from and to the port, rent a car, answered questions, arrange trips, and take care of our needs while there. The villas are clean, tastefully designed and most of all, comfortable. It is obvious they care about the comfort, safety and well being of their guests. So much so, that after we left and arrived at the port for the Parcher back to Athens, one member of our party realize that she had forgotten her purse in the wardrobe of our villa. I called Gianna and her daughter promptly arranged to have my aunt’s purse delivered to her at the port, a service that went above and beyond. Nice family run hotel. Beautiful pool e gardens. Amazing breakfast. Lock in a great price for Abelonas Village – rated 9.3 by recent guests! One of our top picks in Megalochori.Located in Megalochori village, just 1,000 feet from Caldera Cliffs, Abelonas Village features an outdoor swimming pool, a plunge pool with hydromassage facilities and a pool bar. Its accommodations open out onto private furnished terraces or balconies with garden, pool or Aegean Sea views. 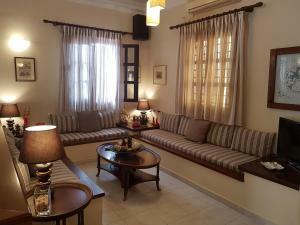 The rooms and studios are air conditioned and offer a TV, fridge and safe. The bathrooms are fitted with a shower and include toiletries and hairdryer. Some units offer a Cycladic-décor, a kitchenette with kitchenware, hot plate, kettle and electric coffee maker, or are split leveled. Continental breakfast is daily offered upon request and extra charge. It is served in the breakfast area or its sun terrace, where you can enjoy views over the Aegean Sea and the garden. Guests can relax on the sun beds and under the umbrellas surrounding the pool. Staff at the front desk can arrange Volcano trips, car and motorbike rental and can provide information on local attractions, such as Fira Town. There is also a 2-way transfer from the airport/port upon request and an extra charge. WiFi is free throughout the property. The main town Fira is a 10-minute bus ride away. Abelonas Village is only a 10-minute drive from the Santorini Airport and Athinios Port. The famous Red and Black Beaches and the excavation of Akrotiri are at a distance of 1.6 miles. A bus stop can be found at 250 feet. Free private parking is possible on site. When would you like to stay at Abelonas Village? This cozy double room features a private entrance, air conditioning and a traditional built-in double bed. The shaded furnished balcony overlooks the pool, the sea and the garden. It offers free WiFi, flat-screen TV, fridge and a private small bathroom fitted with a shower, hairdryer and free toiletries. Other facilities include a safety deposit box. Please note that an extra bed or baby cot cannot be accommodated in this room type. This Cycladic double room has 4 different types of decoration that you can see at this room's photos. 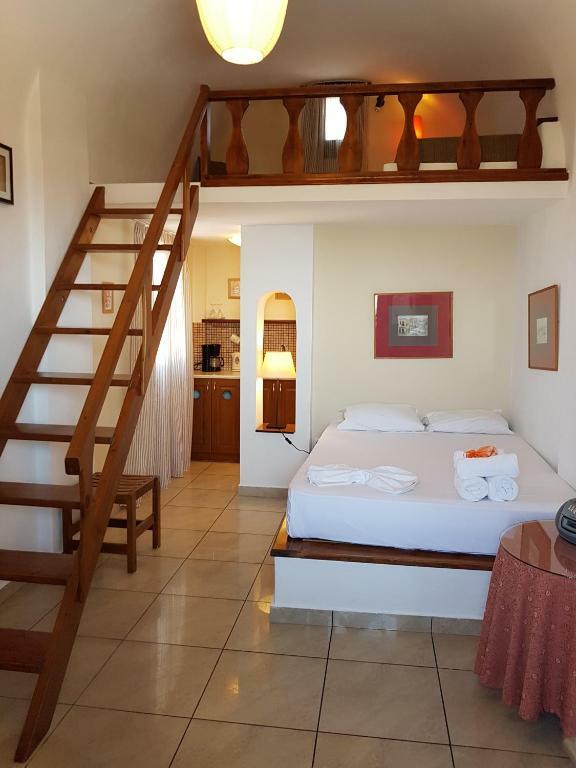 It features a private entrance, a traditional built-in double bed, air conditioning,CD player, free WiFi, air conditioning, flat-screen TV, fridge and a private bathroom with shower. Other facilities include a hairdryer, free toiletries and a safety deposit box. The shaded furnished veranda or balcony overlooks the garden or pool or Aegean Sea. Some of these rooms have a seating area. This quiet cozy double studio features 2 different types of decoration that you can see at this room's photos. It features a private entrance, a traditional built-in double bed, air conditioning and a shaded furnished veranda with a sofa bed that overlooks the garden or the vineyards. It offers free WiFi, a small kitchenette, coffee maker and fridge, a flat-screen TV and a private bathroom with shower. Other facilities include a hairdryer, free toiletries and a safety deposit box. Opening to a patio with garden view, this quiet Cycladic style large double studio features free WiFi, a private entrance, a large double built-in bed, a seating area with two single built-in beds, a shaded large furnished veranda with 2 sofa beds with garden view, a small fully-equipped kitchenette and a private bathroom with shower. Other facilities include a hairdryer, free toiletries, flat-screen TV, air conditioning and a safe box. Please note that an extra bed or baby cot cannot be accommodated in this room type. An extra person can be accommodated upon demand upon an extra charge per night. This traditional - decor split level double room features: a traditional built- in double bed at the upper level and a seating area with a single sofa bed at the ground floor. It has a large shaded furnished veranda with 2 sofa beds that overlooks the hot tub, the pool and the garden. -air conditioning, tile/marble, CD player, a private bathroom with shower, hairdryer and free toiletries. An extra person can be accommodated upon demand upon an extra charge per night. 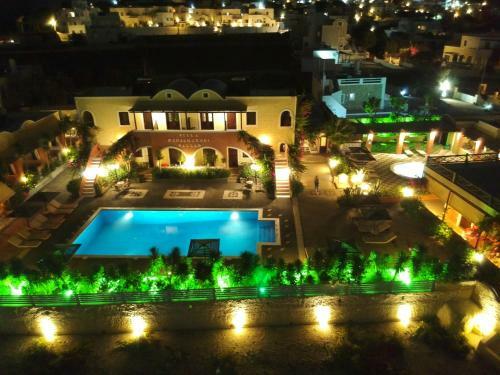 In order to offer our guests amazing holidays in Santorini island, we created the family hotel ABELONAS VILLAGE an A' class complex of rooms and studios, situated 300m. from the world famous Caldera. Megalochori traditional village is famous for its neoclassical buildings, vineyards , wineries and stone cobbled small streets. Just a short walking distance from the famous Caldera, you can see the fantastic sunset and the breathtaking view of the Volcano. Our hotel is a heaven of family hospitality and relaxation. 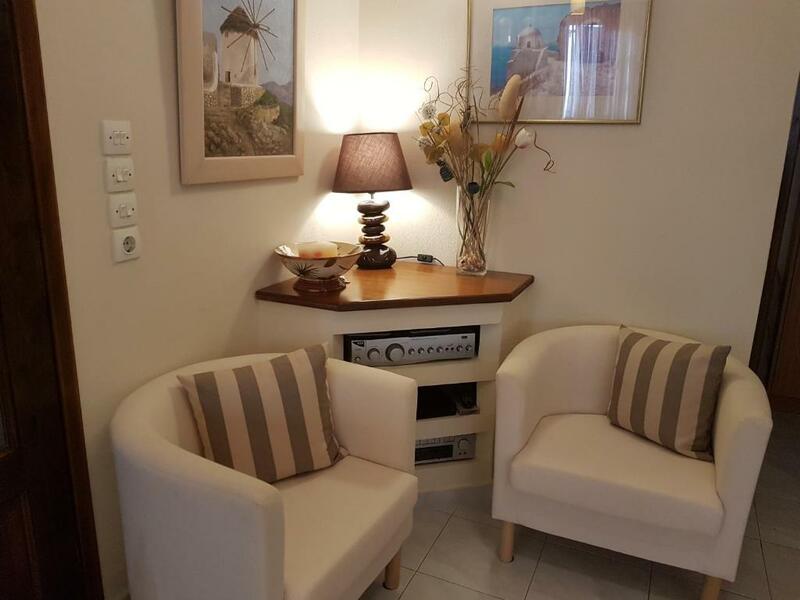 We are trying to do our best in order our guests to feel like home. We welcome our guests by offering them reasonable priced holidays, high quality service and OFFER PRICES, for an unforgettable vacation in Santorini. In Megalochori traditional village you can visit old churches, local wineries and taste the fine quality Santorini wines (vinsanto, assyrtico, mandilaria). There are also traditional taverns, Cafe Bar, Super Markets, Art galeries, Bakeries, Pharmacy, Cars/motos rental offices, tourist office, gasoline station etc. House Rules Abelonas Village takes special requests – add in the next step! Abelonas Village accepts these cards and reserves the right to temporarily hold an amount prior to arrival. Please note that some rooms can accommodate an extra bed upon request and extra charge. Children older than 14 years old are welcome upon request and extra charge. Please note that the property does not accept bookings from agencies. Please note that the card holder's name must be the same as the guest's name. Please note that for reservations over 10 days, a 30% deposit is required. Please note that for reservations for more than 2 rooms, a 30% deposit is required. The breakfast is very good, the bed is excellent. Main issue was the extremely small bathroom. My husband needed one leg in the shower and on leg on the toilet floor when sitting, lol! Bathroom is tiny. Shower also tiny. Poolside bar was shut the entire time, and it was peak season when I stayed. The staff are very friendly and helpful. They gave us info on Santorini and the bus timetables. Answered any questions we asked and arranged transport for us to the port when we left. Good location just near Megalochori traditional village (5 mins walk away) and right outside the bus stop. The village is really nice with great places to eat and local shops. Room was cleaned everyday, towels replaced and bed made. Breakfast is available for 6 euro in the mornings which is a buffet breakfast type thing. They also organise excursions to the volcanic islands but we couldn't go whole here because of the bad weather. There are 2 pools a little one with seats and a bigger deeper one. Also lots of sun loungers. Was nice to be able to have a swim. The parking lot is very crowed when guests have rental cars. A car is needed to see the sights on the island. Beautiful hotel with everything you need for a relaxing time in Santorini. Nice breakfast, clean rooms, beautiful pool area, and nearby restaurants. We rented a car during our stay however there was a bus stop nearby. Worth staying at Abelonas if you want to stay in an area far from all the touristy attractions and buzz. I hate this question, but I feel like I must put something. If there was anything we would change, we'd ask for "Do Not Disturb" signs so the cleaning crew didn't have to clean our room everyday. We don't need a daily cleaning and I'm sure the cleaning crew would like to skip a room or two each day if possible. Taking this into account, our room might have been missing a sign or something so this might be a non-complaint...although this is really not a complaint. This place was wonderful and we love everyone working there! Great location with many things around the village. Friendly staff always willing to help. Highly recommended!! Rooms are small - bathroom is tiny. Family run and they really care about the facility and their guests. Super clean. Grounds very pretty. Located near a beautiful village. Amazing staff, extremely helpful, the location was perfect only a few minutes walking distance from the old town when you can find excellent taverns with amazing food for extremely great value for money.